As is common in financial engineering, we face a trade-off between the generality of the asset price dynamics and the type of solution that it admits for the tail probability of the logarithmic return process. In the working paper, we make the deliberate choice not to incorporate all observed stylized empirical facts but only those that do not restrict the analytical tractability, focusing on the flexibility of the jump size distribution. Like any pure Lévy model, the AD-DG jump-diffusion process has stationary increments. Although it can be calibrated to the market implied volatility smile of any single maturity, its lack of heteroscedasticity implies that that it is not able to fit the term-structure of implied volatilities. In this blog post, I generalize the AD-DG jump-diffusion dynamics to incorporate a stochastic volatility component. This extension is straightforward and I derive the corresponding characteristic function of logarithmic returns. While the tail probabilities are not known in closed-form any more, I obtain a semi-analytic expression in terms of an integral that has to be evaluated numerically. European plain vanilla options can be prices through Fourier inversion methods such as, for example, the Carr and Madan (1999) fast Fourier transform and the Fang and Oosterlee (2008) COS approaches. Here, the instantaneous variance follows a mean-reverting square-root process as in Heston (1993). and are two correlated one-dimensional Brownian motions under with . is the speed of mean reversion, is the long term variance level and and is the volatility of variance. I refer to the original articles by Cox et al. (1985) and Heston (1993) for further details. The remaining notation is as in Thul and Zhang (2014). In particular, is a sequence of i.i.d. AD-DG distributed random variables independent of , and . Here, and are the numerically unconditionally stable representations obtained by Albrecher et al. (2007). The characteristic function of the AD-DG distribution is as derived in Thul and Zhang (2014). 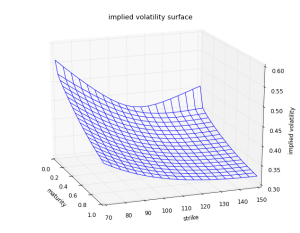 The following plot shows a sample implied volatility surface for the stochastic volatility jump-diffusion model. The parameters are , , , , , , , , , , , . We observe that this plot reflects many of the characteristic features of real-world implied volatility surfaces for equity underlyings; see for example Fengler (2006). For short times-to-maturity, the jump component generates strongly convex implied volatility smiles. As the time-to-maturity increases, these transition into a skew shape generated by the negative correlation between the variance and spot processes. The implied volatility term structure in the example is downward sloping since the initial variance is higher than the long term level. 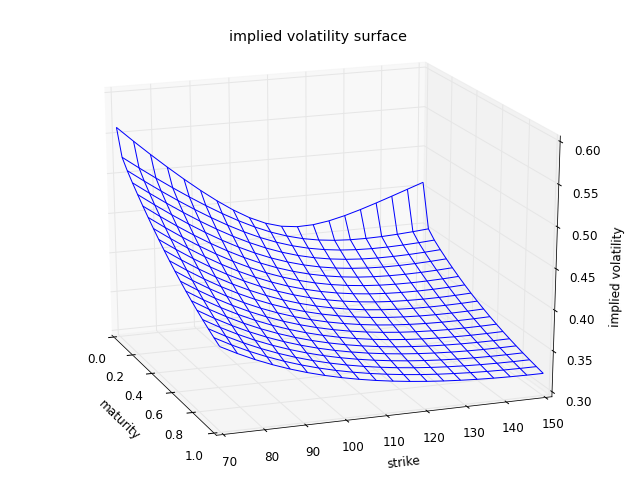 I implemented the implied volatility surface construction in Python and the script is attached below. It provides a minimal example of how to construct the implied volatility surface under the proposed model dynamics. The code is optimized for readability instead of performance. For practical implementations, I recommend to use the Fang and Oosterlee (2008) COS method, which exhibits better stability for out-of-the money options compared to the Carr and Madan (1999) approach. Both pricing representation can be optimized to simultaneously evaluate a vector of European plain vanilla options with different strike prices. This entry was posted in AD-DG Jump-Diffusion Model and tagged AD-DG, characteristic function, jump-diffusion, stochastic volatility by Ally Quan Zhang. Bookmark the permalink.